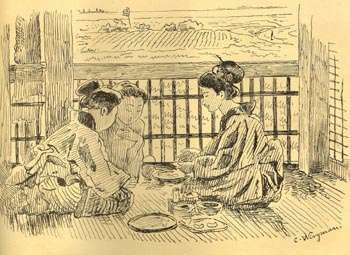 A Sketch Book of Japan, C. Wirgman, Yokohama (26 Water Street), printed and published by R. Meiklejohn & Co., not dated but ca 1884, horizontal 8vo (7 7/8 x 10 1/2 in - 20 x 26.7 cm), hard boards, decorated cloth, edges beveled, 39 tinted lithographs (including the title page) reproducing sketches by Charles Wirgman, each lithograph protected by a tissue guard, no text. 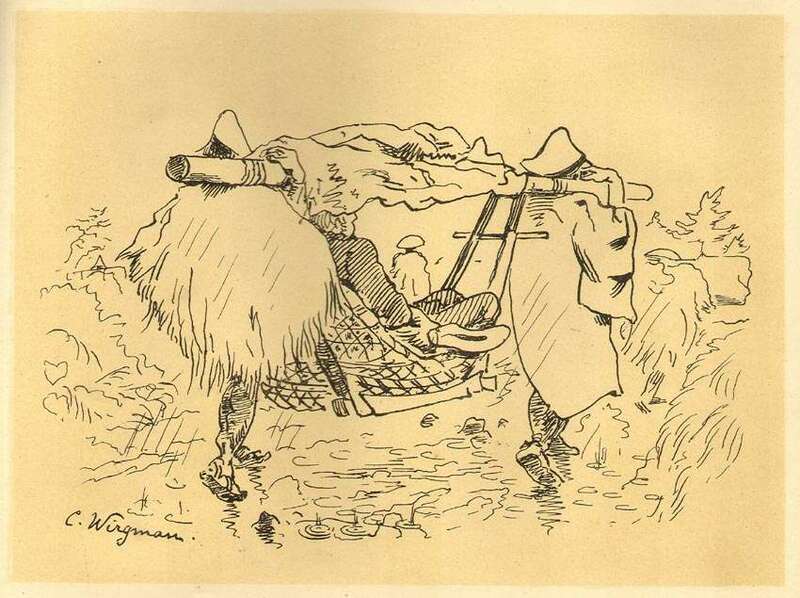 Wirgman's sketches are reproduced by the lithographic printing process in black against a light tan background (tint). The plates measure 19 x 24 cm. The actual images (including the tinted area) are uniform in size covering ca 60%+ of the page (ca 14.5 x 19.5 cm). 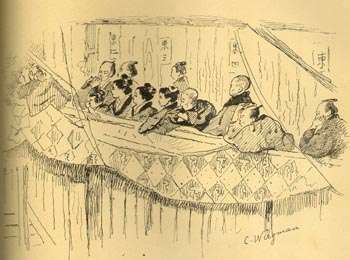 Eight of the illustrations are in a vertical format and the other 31 illustrations are in a horizontal format. 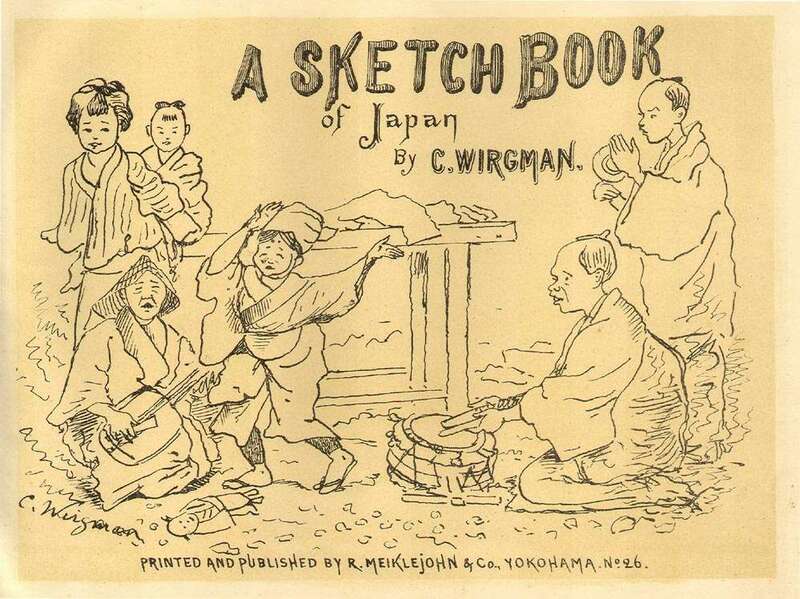 This book and Charles Wirgman are discussed in a paper by John Clark titled "Charles Wirgman (1832-1891), recent discoveries and re-evaluations" which is published in British Library Occasional Papers II, Japanese Studies (published in 1990). 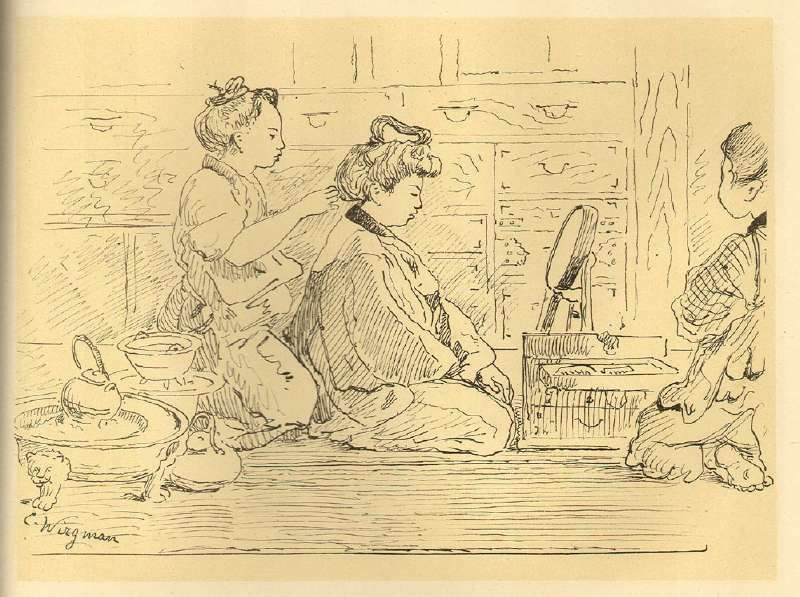 In this paper Clark dates the book to 1884 and references a letter from Wirgman to his brother dated 18.4.1884 which transmitted a copy of his "A Sketchbook of Japan." 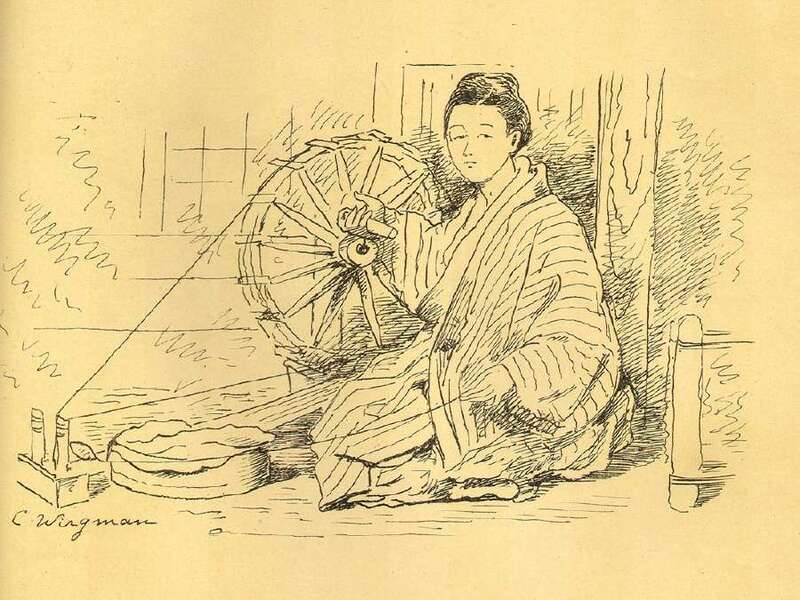 Clark reports this book as having 39 illustrations and reproduces one of them ("Figure 63 From an album of 39 Japanese woodcuts after drawings by Charles Wirgman") (at page 272). 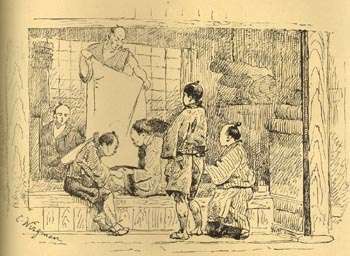 The image Clark reproduced in his paper is a market street scene. It is not present in this book. 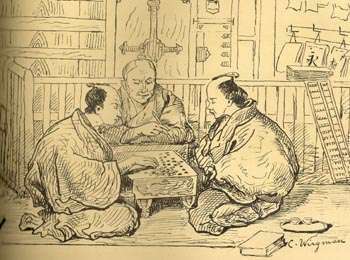 This gives rise to the possibility that a different book with woodcut illustrations was produced. 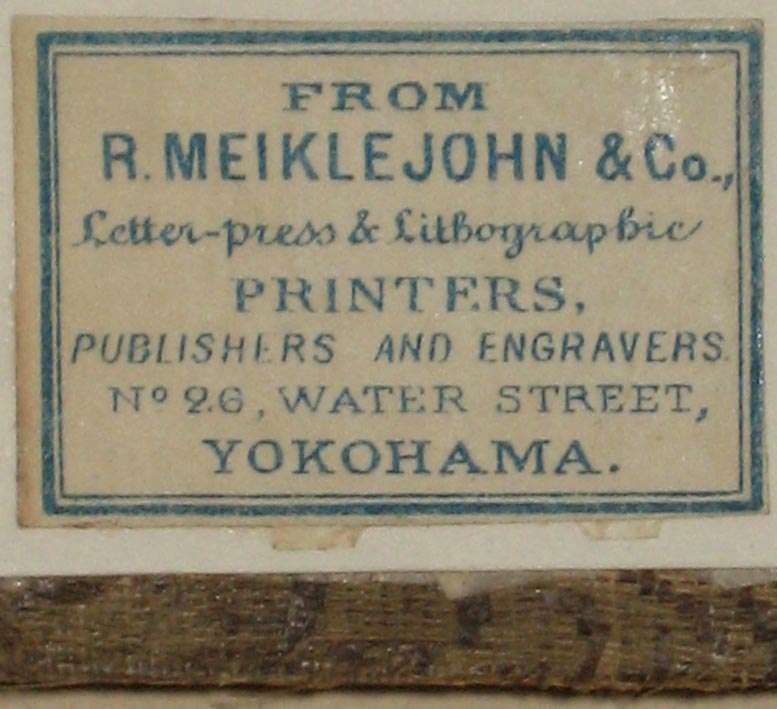 If such a book exists, I find it doubtful that it was published by R. Meiklejohn & Co., as they specialized in letter press and lithographic - not woodcut - printing. For more information on the book with Clark's paper, click here. 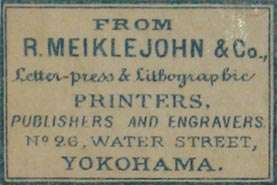 At this same time R. Meiklejohn & Co. was also printing Wirgman's Japan Punch and his sketches in that publication were printed using the lithographic process (not tinted, just black on white). 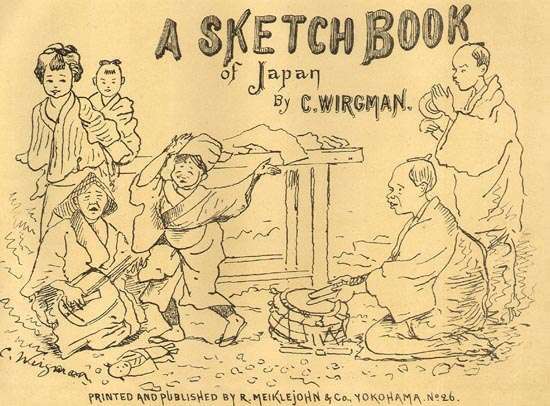 Wenckstern describes a book with the same title as "Wirgman, C. Sketchbook of Japan, containing 32 drawings in outline from Japanese daily life with accompanying explanation, oblong 4to, Yokohama, no date ." I have not confirmed the book reported by Wenckstern. 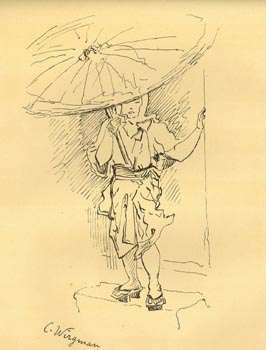 A Sketch Book of Japan. 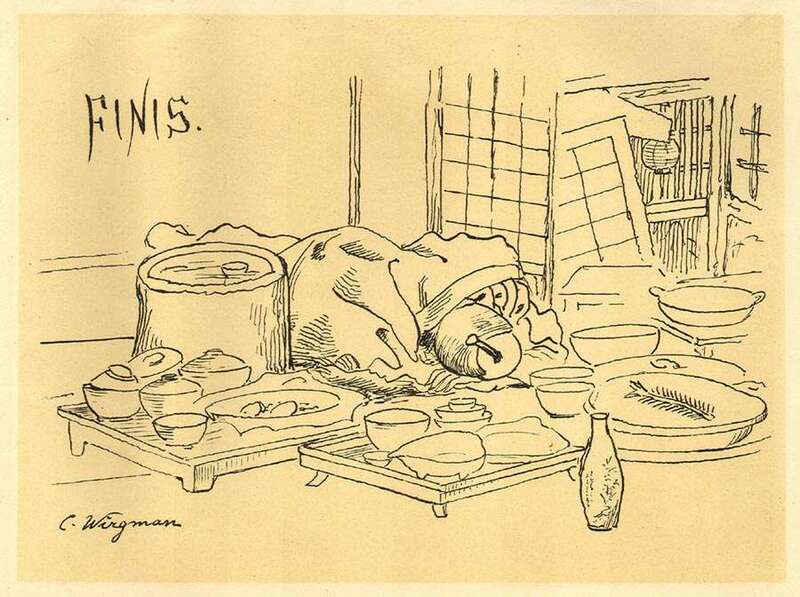 By C. Wirgman. 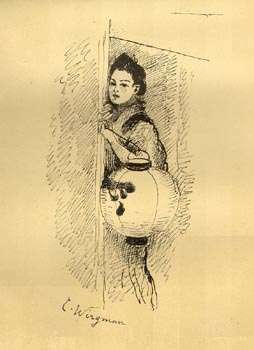 Containing 39 humorous sketches on the manners and customs of the Japanese, with accompanying explanations. 1884 (at page 294). I have not confirmed this book reported in the China Review either. You sometimes find the book dated to 1885 and even as late as the early 20th century. 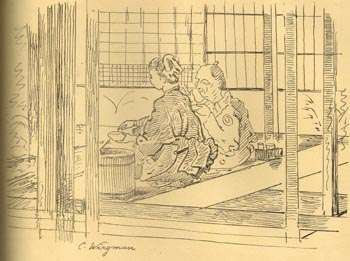 Charles Wirgman's life before and in Japan is discussed in a paper by John Clark titled "Charles Wirgman (1832-1891), recent discoveries and re-evaluations" which is published in British Library Occasional Papers II, Japanese Studies. For more information on the book in which this paper is published, click here. A Wirgman Book. 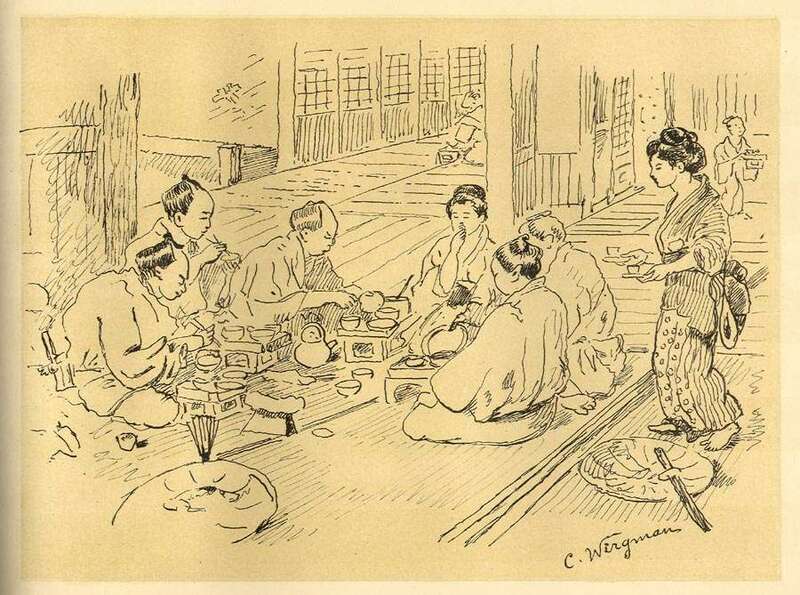 The only book that I am aware of published by Wirgman is his Sketch Book of Japan published in 1884. More information on that book can be found here. 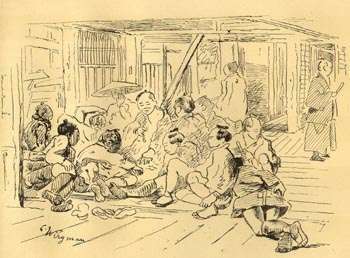 The Japan Punch. 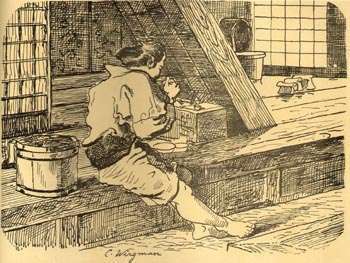 Wirgman arrived in Japan in 1861. 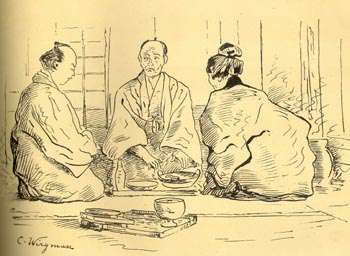 In the following year he began his hallmark publication, The Japan Punch. 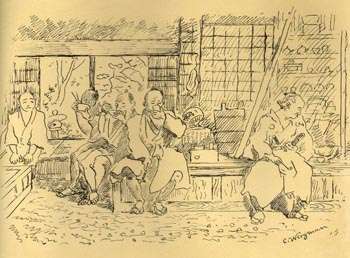 Jozef Rogala, in his book, The Genius of Mr. Punch (info here), provides important insights into the publication of The Japan Punch and reproduces many of the illustrations. 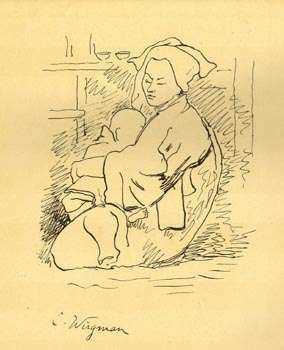 First Issue in May, 1862. 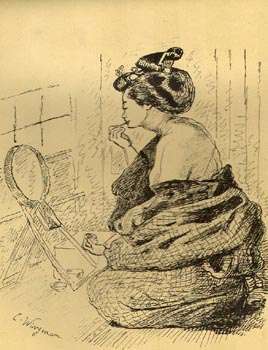 The first issue was in May of 1862 and two more issues were published that year (June and July). The first issue had a picture of the British Mr. Punch and the Japanese Mr. Punch on the front cover. Thereafter, only the Japanese Mr. Punch appeared on the front cover. Hiatus. 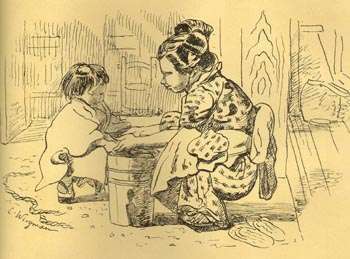 From August 1862 through a portion of 1865 publication was suspended. 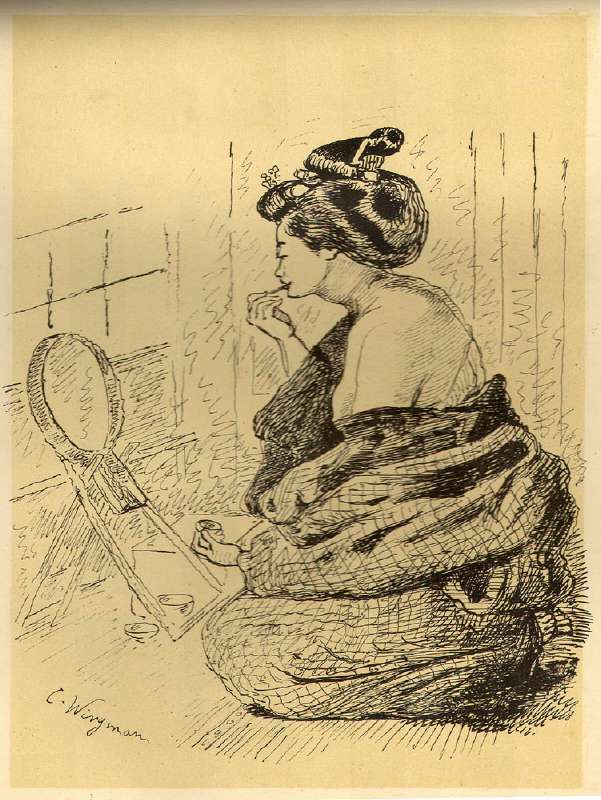 Last Issue in March, 1887. Regularity. 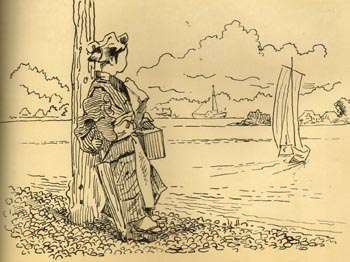 Beginning in 1865 (month not established) publication resumed on a sporadic basis but generally monthly. Dating Issues. Prior to 1883 the year, but not the month, is on the front cover. In 1883 the year and month appear on the front cover. Occasionally the text portions of the publication contain dates and these provide some help in determining the month of publication. I have noted issues from 1876 forward with the month handwritten. The papers were not assigned whole numbers or series numbers. Printing Method. 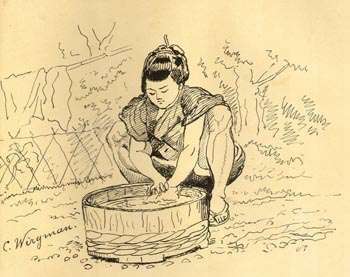 From 1862 through 1883, the publication was woodblock printed. After that it was lithographically printed. Number of Pages. Usually 10 or more (counting the front cover) pages per issue. All pages were printed one side only. The blank back side of the last page is the back cover. Paper Type. 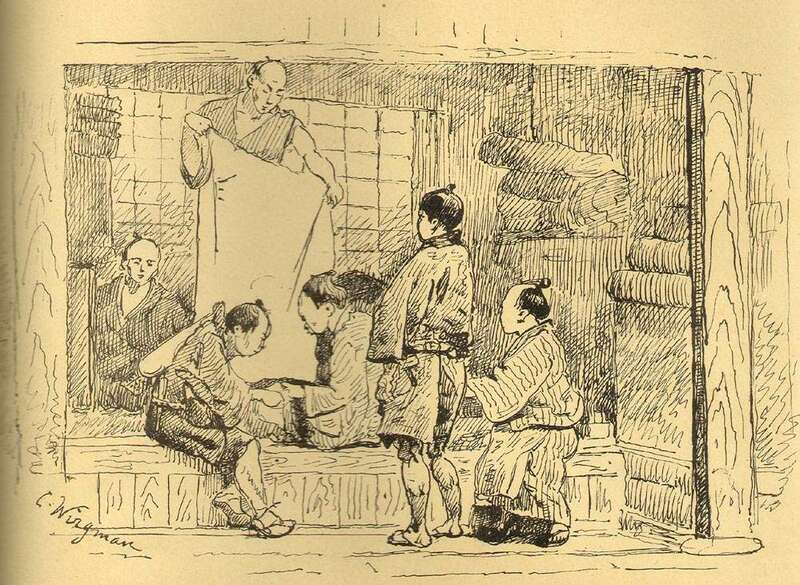 The paper is a thin high quality Japanese mulberry paper with a visible laid pattern from the manufacturing process. The paper is supple/pliant and does not become brittle. 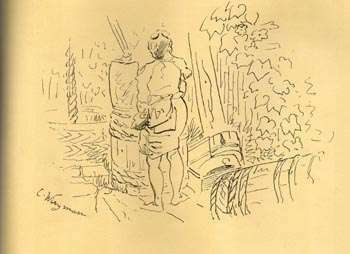 The paper is thin enough that images from the page below are visible. For a high resolution image of the paper, click here. Page Size. The page size varies slightly among issues. The usual size is large 4to (9 1/2 x 13 3/4 in - 24 x 35.2 cm) but it varies. The largest size paper I have seen is 10 1/4 x 14 5/8 in (25.6 x 37 cm) You often see the size described as folio. Binding Method. The paper was originally bound with a simple (flimsy) single string tie affixed through 4 holes. The individual issues are sometimes found bound into book form with the string ties removed. Subscription Price. I have seen the subscription prices ranging for $1.00 per issue for the early issues to $2.00 per issue in later years. It was a relatively expensive periodical. Key Characters. 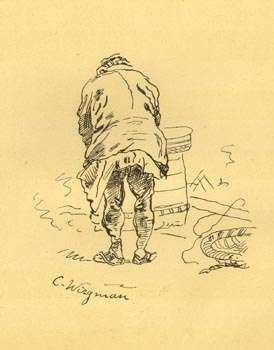 Wirgman's caricature in the illustrations is referred to as "The Artist." 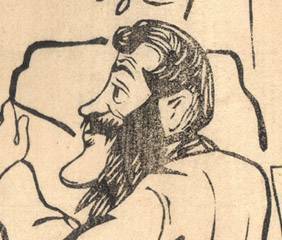 Other recurring caricatures included "Count Collodion di Policastro" (Felix Beato), "Public-Spirited Man" (William H. Smith) and "Sir Smiles" (Sir Harry Smith Parkes). 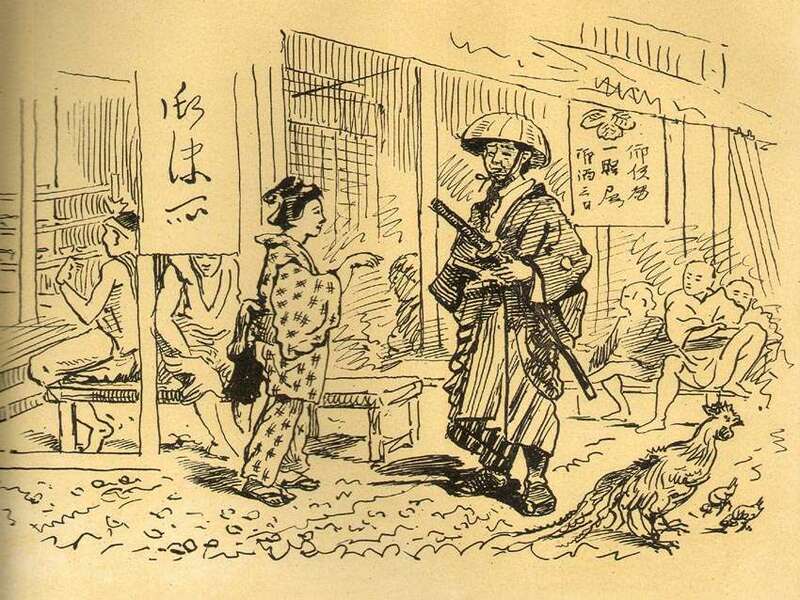 The Samurai character on the front cover is a caricature of Wirgman. Issues Documented on this Web Site. 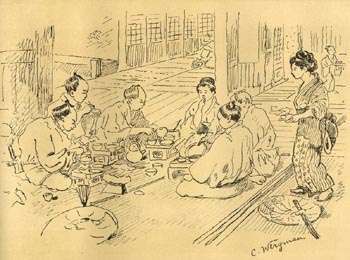 The Japan Punch was clearly targeted at the small, but expanding, group of Westerners then residing in Japan. 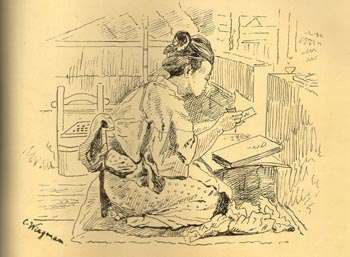 The Japan Punch is sometimes described as the first English language periodical published in Japan. 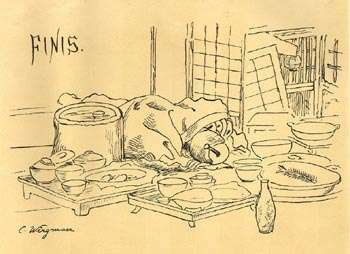 It wasn't long before Japanese publications mimicked Wirgman's style much to the consternation of the Government. 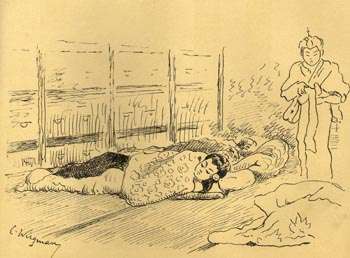 Wirgman's Japan version of Punch was in the same tradition as the British version. 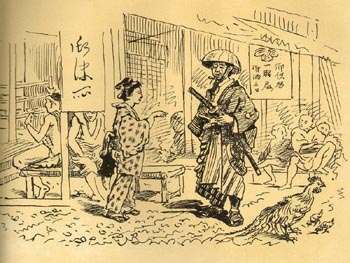 However, it satirized politics, society, and customs relevant to the Westerner living in Japan. The publication history of the magazine is rather murky. 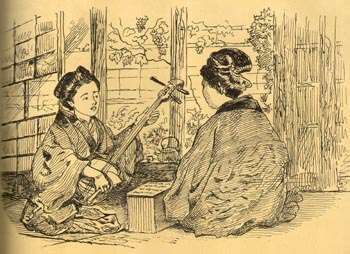 Wenckstern only notes, "illustrated and edited by C. Wirgman, Yokohama. -- Discontinued since the artist's death." Considering that this comment was published in 1895, it seems clear that precise information regarding the publication was not readily available, even at that time. 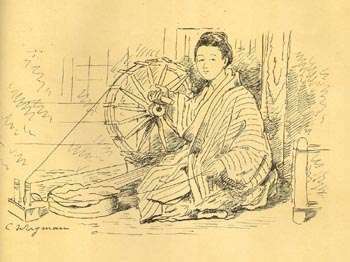 A Japanese publisher (Yushodo Press) offers a 10 volume (3,100+ pages) reprint of the periodical described as covering the period from May 1862 through March 1887 with publication suspended from 1863-1864. 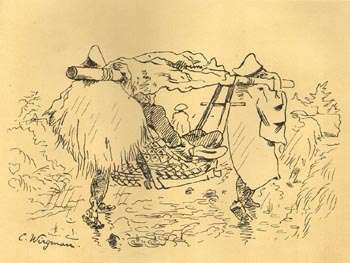 Wirgman's Art Work in General. Wirgman worked in association with Felice (Felix) Beato in hand coloring Beato's albumen photographs during the period from 1864 through 1867. 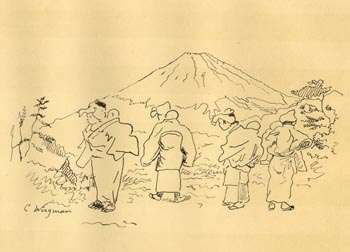 Through this association in Yokohama, he also marketed his own albums of sketches, and individual watercolor and oil paintings. 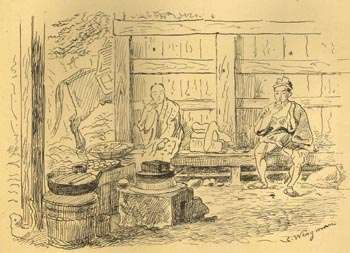 Dating to this association with Beato, Wirgman is especially noted for his work in hand coloring the albumen photographs in Beato's Native Types albumen photograph album published in 1868. 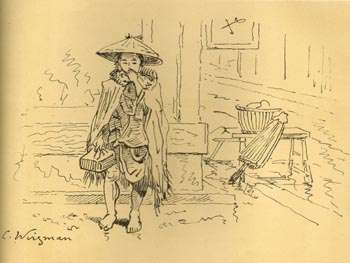 Charles Wirgman is well known for his satirical sketch cartoons as well as real life pencil sketches and oil and watercolor paintings of Japanese scenes and characters (Japanese and Westerners in Japan). 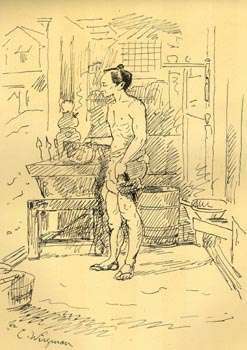 He is also noted for teaching Western style drawing and painting techniques to Japanese artists. Toba-e Style. 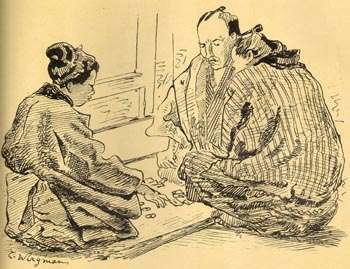 Some, but not the majority, of Wirgman's art reflects the then popular "Toba-e" style of Japanese art. The Toba-e genre is characterized by roughly executed figures with long skinny limbs and gaping mouths. Illustrated London News (ILN). 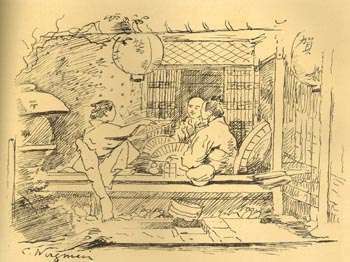 Wirgman served as a ILN sketch artist and reporter in Japan for over 20 years. 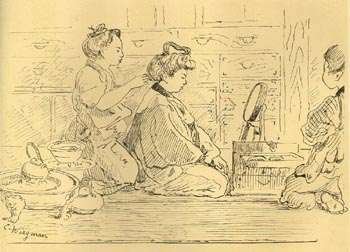 His first ILN piece regarding Japan appeared in the August 10, 1861 issue and his work appeared regularly as "Special Artist and Correspondent" through August of 1868. 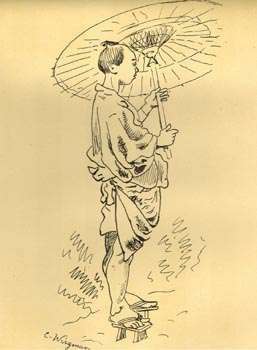 Thereafter his work appeared sporadically through June of 1887. 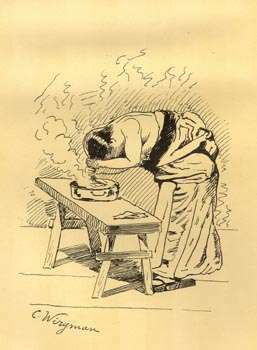 Wirgman died on February 8, 1891 in Yokohama and his obituary was published in the March 28, 1891 issue of the ILN. 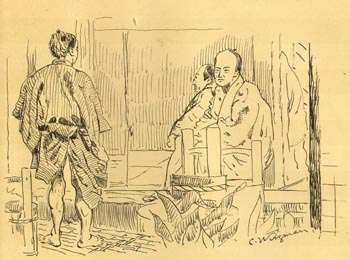 The Capital of the Tycoon: A Narrative of a Three Years' Residence in Japan 1863, Sir Rutherford Alcock. 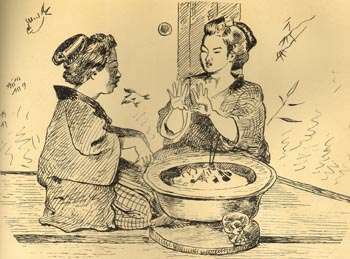 This book contains 16 chromo-lithographs of Japanese people and scenes. 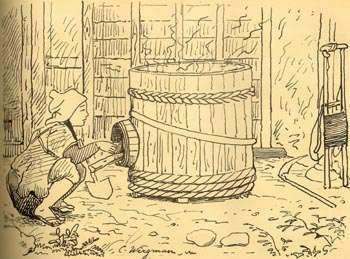 Wirgman's work is credited ("C. Wirgman del.") as the basis for 12 of these plates. For more information on this set, click here.